Père-Lachaise Cemetery, located in the eastern Part of Paris, France, is burial site to many notable figures. Below is the grave of Jim Morrison, poet and lead singer "The Doors," who died 3 July 1971. "The Doors were a 1960's era super group, whose influence may be stronger now than at the height of its fame. March 2005 photograph of the Morrison grave site, taken by "Funny Girl." 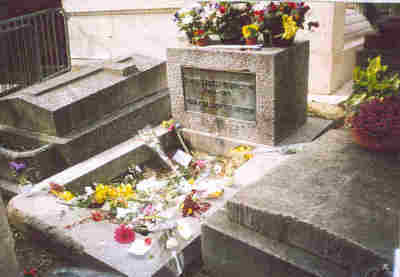 Every 3 July, the anniversary of the death of Morrison, in 1971, people from all over the world make their way to this grave. Fittingly, members of "The Doors" community gather to recite the poetry of Morrison. Mostly they honour Jim, his work and his legacy. Click here to read more about the on-going tribute to Morrison, "A Tribute in Motion." Click here to see the poster for the 2007 "Tribute in Motion." Several notables, mostly writers and artists, but a lot of important historical figures, too, share Père-Lachaise Cemetery, with Morrison. Here are just a few: Sarah Bernhardt (1844-1923), Frédéric Chopin (1810-1849), Auguste Comte (1789-1857), French social philosopher; Nancy Cunard (1886-1965), and English poet, writer, anarchist activist; Oscar Wilde (1854-1900), Irish poet and wit, author of "The Picture of Dorian Grey"; Clarence John Laughlin (1905-1985), American Surrealist photographer; Allan Kardec (1804-1869), born Hippolyte Leon Denizard Rivail, was the founder of Spiritism; Yves Montand (1921-1991), Italian-bored singer and film actor; Marcel Proust (1871-9122), French intellectual, novelist, essayist, critic and author of "Remembrance of Things Past"; Édith Piaf (1915-1963), the most widely-known French singer; Alice B. Toklas (1877-1967), American author and partner of Gertrude Stein -- Toklas' name and information are etched on the obverse side of Stein's gravestone, in the same sparse style and font: as they were inseparable in life, so too, in death; Honoré de Balzac (1799-1850), first writer to use fiction to convey the state of society. Good company, one and all, for a poet. Kathleen Riddell is a doctoral candidate at the University of Waterloo. Her research focus is pop culture, especially how Johnny Cash, Jimi Hendrix and John Lennon are commonly spoken and thought of in religious terms.